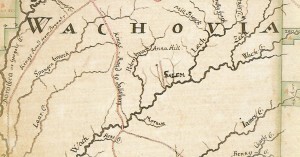 Bethania was established in 1759 as a self-sufficient farming community which allowed both Moravian and non-Moravian settlers. Surveyor Christian Philip Gottleib Reuter designed Bethania to withstand the challenges and dangers of the often hostile frontier landscape during the tumultuous years of the French and Indian Wars. Borrowing from town designs used in Medieval Europe, Reuter clustered the individual home lots in the center of the 2,500 acres that comprised the Bethania Town Lot and surrounded these residential lots with land segregated into orchard lots, bottom land lots, and upland lots. The town included houses, tradesman shops, a church, school, barns, and gardens. Now more than 250 years later, historic Bethania is the only example of a European style “open field” agricultural village remaining in North Carolina. This Town Plan, and many of the historic Moravian-influenced buildings of Bethania, has been preserved to the present. An agricultural and trades community by design, Bethania exemplifies Old World planning and New World adaptation. Bethania’s 500-acre Historic District, listed on the National Register of Historic Places, has also received the highly-respected designation of National Historic Landmark. Located just above the original northern boundary of the Wachovia tract when constructed, this house is an important early nineteenth century hand hewn dwelling with brick nogging. The structure is an unusually well crafted dwelling with plastered walls, molded chair rail throughout, six-paneled doors and three-part mitered surrounds for doors and windows. The mantels have arched openings with raised, single panel friezes above the hearth. 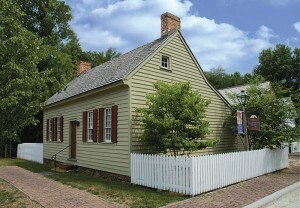 The historic house was in an unstable condition, when purchased by the Town and relocated to its current site in January of 2004. Stone from the original site was saved for reuse and the original interior woodwork was recovered, purchased and reinstalled. The house faces Bethania Road to assist the visitors understand that the house was moved to the site, but at the same time reinforce the sense of a streetscape. Town streetscapes, during the 18th and early 19th century, possessed buildings placed right up to the sidewalks with no front lawns. It was not until later during the 1800’s that houses would be pulled back to give a small front yard. 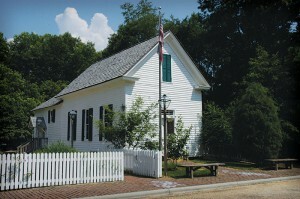 The subsequent restoration of the house as a Museum and addition of a Visitors Center was accomplished as a result of grants received through the NCDOT’s Transportation Enhancements Program.